Whether you’re being kind to yourself, your peers or your partner, kindness always wins. But one thing we often forget is that we need to be kind to the environment. For the past little while, I’ve been really focusing on my kindness towards the environment and what I can personally do it create less waste that would simply sit in a landfill. 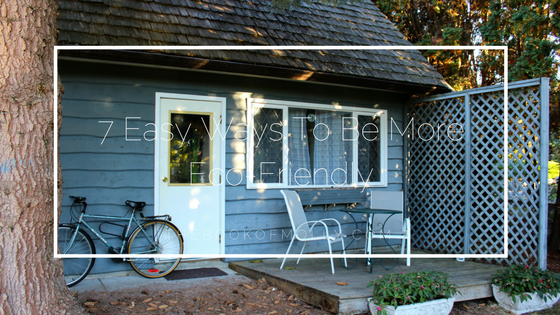 So, I wanted to share with you 7 EASY ways to be more eco-friendly. If you put even one or two of these things into practice, you will be exuding kindness to the ground that you walk on every day. First and foremost, get yourself a reusable water bottle. There are so many different options out there. Not only will it help you stay hydrated, but saying no to plastic water bottles helps the environment. I used to always buy water when I was out and about or on road trips. Now I always bring my Swell water bottle and it’s wonderful. There are so many grocery stores that charge for plastic bags, which is really good because it’s pushing people to bring their own reusable bags. I know we’re not perfect and sometimes I forget to pack mine in my car, but always try to remember when you’re heading out the door. A good tip is to simply keep all the bags in your car or by the door, that way you’ll have them ready whenever. Similar to grocery bags, a really great thing to buy is reusable produce bags. Instead of using the plastic bags at the store for your fruits and vegetables, buy some reusable ones. I bought Matthew some for his birthday from Unless Market in Kelowna and they’re great for smaller veg like Brussel sprouts! You can always say no to all bags and just put your fruit and veg into your cart and straight into your bag. That’s what I do. No need for those plastic bags. Now we all know I love coffee. I like to enjoy a coffee day in the afternoons at work and treat myself sometimes on the weekends too. I’ve been trying really hard to always remember to bring my own mug. This will eliminate the use of paper cups and plastic lids. Plus cafes usually give you a small discount for bringing your own mug. Even if you’re getting a fancy latte, just ask to put it in your mug. They’ll always say yes! I have been recycling for years and it feels good. The biggest tip on this one is to wash before you recycle. If it’s not washed out, it won’t actually be able to be recycled and will go into a landfill. So, wash your coffee cup out and dust off the pizza crumbs from the box before putting it into the recycling. Tonight I had to run to the store that is about a 7-minute walk away. Instead of getting into my car and driving down the road, I hopped on my bike. It was a quick bit of exercise and my car didn’t have to turn on. Cars are a huge form of pollution to the environment. They produce significant amounts of carbon monoxide, nitrogen oxides and other pollution. Now that it’s getting nicer in Kelowna I can’t wait to start riding my bike to work. It’s an easy 30-minute bike and I’m being kind to the environment, getting fit and saving money. It’s a win-win. If you’re not into cycling, you can always carpool or ride public transportation when possible. Simply put, when you go out say no to straws. You don’t need them. Just use your mouth. 80% of all marine debris found in the ocean is land based, and 80-90% of the marine debris is made from plastic? We have a problem with using “disposable” options, but sadly plastic isn’t disposable. So, next time you’re at a bar, or out for dinner, remind the wait staff that you don’t need a straw in your drink! Some restaurants have actually banned straws in Kelowna including Sturgeon Hall and Fernando’s Pub. While these are only 7 simple things, if you choose to do them you will be showing your kindness to the environment and to yourself. I have SO many other things I do to show kindness to the environment and different ways to be more eco-friendly. Let me know if you’d be interested in me doing more blog posts on this subject! While you may think that 1 person can’t make a difference or change the world, that’s not true.